Our before school routine used to look like: Me getting up later than I planned, waking our kids up, making sure they got out of bed, getting them into the kitchen for breakfast and then to the living room for school before getting dressed, then feeling frustrated because I felt behind. Breakfast was often not cleaned up until lunchtime, laundry was not getting done, and–worst of all–we were often cranky and irritated with each other. This was not a good before school routine! So, I changed it for the better. Our mornings are a lot better now with a positive before school routine instead of a negative one. Following five simple steps has helped us all to be ready for our school day with less stress and more focus. Yes. This is an important first step. It takes less than five minutes, but makes such a difference. This step is for me and for our kids. Have you ever walked into your bedroom during the day to see an unmade bed? How did you feel? Did your shoulders slump seeing the untidiness in your bedroom? Did having the bed unmade make it easier to leave other things undone or cluttered in your bedroom? Do your kids get irritable when they walk in their bedrooms and the bed is unmade? Our kids like to lay on their beds to read. That does not work so well when the bed is unmade. Making our beds gives us an accomplishment first thing in our day. It sets the tone for tidiness in our bedrooms as well. We are more likely to keep other parts of the room neater when our beds are made. 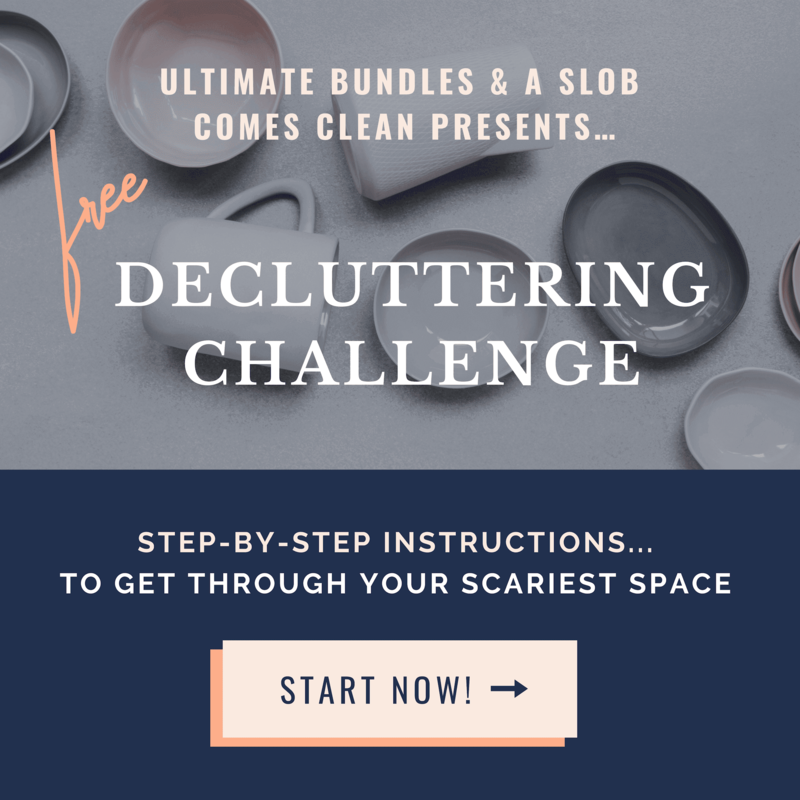 When we walk into our bedrooms later in the day, if we are frustrated, a messy bedroom adds to our aggravation; a tidy bedroom is soothing and can feel like a place of refuge. It all starts with making the bed. 2. Start a load of laundry. For me, I don’t like to realize at 3pm that we have two loads of laundry to do and we have a meeting to go to tonight, so it won’t all get done and something is in a dirty clothes basket that our child needs tonight. This is not a good feeling. Our washer and dryer are in our garage, which is between the bedrooms and the kitchen. A habit we have gotten into is to start a load of laundry before breakfast. As we walk from our bedrooms to the kitchen for breakfast, we just grab a laundry basket and stop in the garage to start a load. When we have a short break in the morning, we switch the load to the drier and start a new load if we have another one to do. Then, we put the clothes away on our lunch break. Each month, one of our children is assigned to help with laundry, so this makes it easier, too. 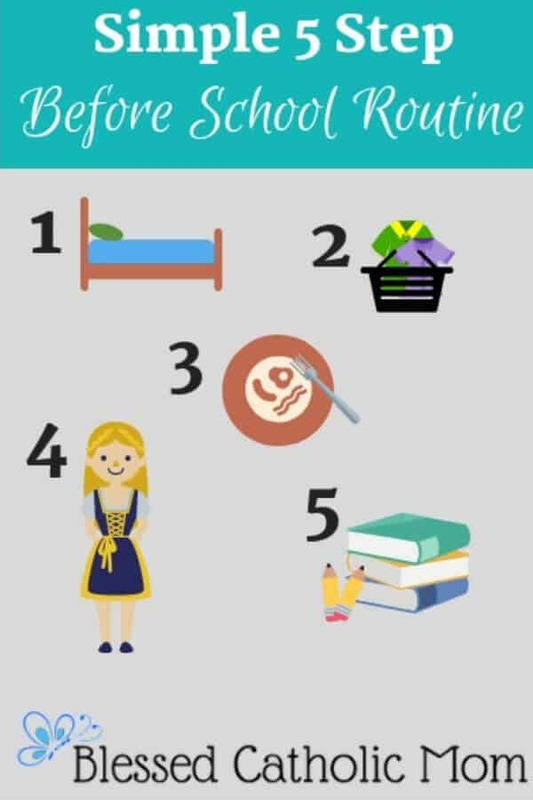 This simple step of starting a load of laundry during our before school routine has played an important role in reducing stress for our family! 3. Eat breakfast and clean up after breakfast. For us, not eating breakfast results in cranky kids and cranky parents. Eating breakfast gives us all a good start to our day. 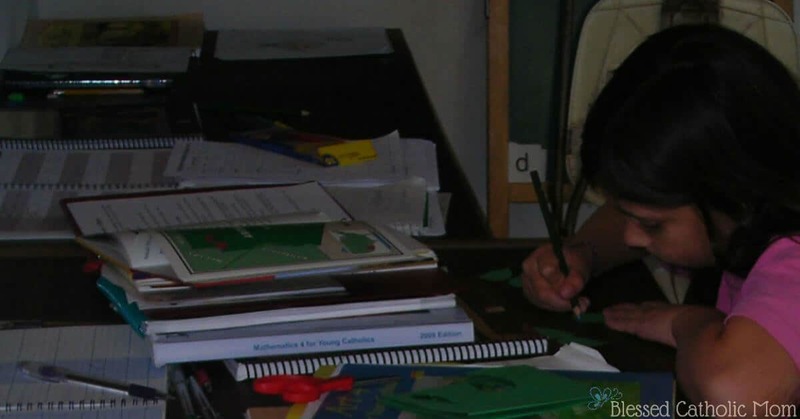 Recently, after an hour or so of school, our youngest child started getting irritated about his schoolwork and his attitude in general was declining. I was getting frustrated with him, and then a light-bulb went on in my head. I had eaten breakfast earlier than our kids that day, so we had not eaten together. I asked him if he had eaten breakfast. “No,” was his reply. I told him to finish what he was working on and then go and eat. Eating breakfast made a big difference in his attitude when he resumed his studies. There have been many studies done over the years about the positive impact breakfast has on us. It is important to remember that food is fuel for our bodies. 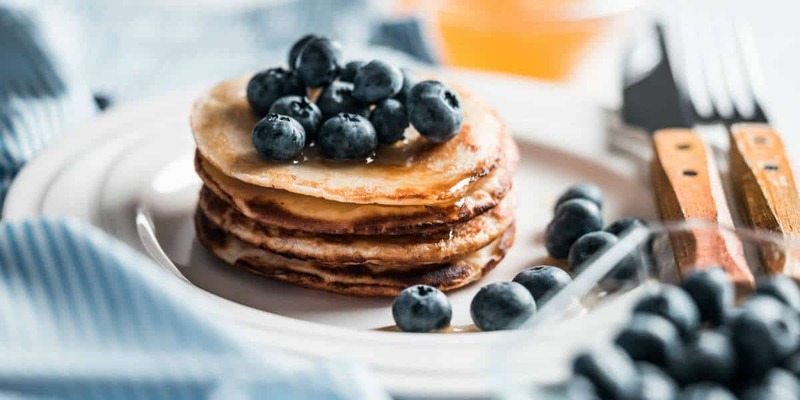 We need a good breakfast to fuel our bodies if we expect to be focused, productive, have a good mental attitude, and be in a (hopefully) good mood. Does walking in the kitchen for lunch make you cringe when you see dirty dishes and cups on the table and counters that have been left over from breakfast? It does for me. I feel behind, frustrated, annoyed at our kids for not cleaning up after themselves, and annoyed at myself for not reminding them to clean up after themselves. I like to aim for less frustration in my day, not more! So, after we eat breakfast, everyone is asked to clean up after themselves. Sometimes this takes some prodding and reminding, but it has a positive impact on everyone’s attitudes. At lunchtime, our hungry kids would rather see a clean table rather than have to clean up from breakfast before they can sit down to eat lunch. Getting dressed before we begin our schoolwork means we are getting ready for our day. Still walking around in pajamas or the clothes I slept in means, to me, that the night is not over and that I am not ready to take on the tasks of my day. Getting dressed is practical in that we are now wearing what we need to wear to accomplish what tasks or appointments we have in our day. It also impacts our mindset in that we take off the night and put on the day. We are getting ready physically and mentally for our day. 5. Get out books and materials that will be needed for the day. Have you ever heard, “Where is your pencil?” or “What happened to your eraser?” or “Where is your math book?” If so, you must have been to my house. I tell our kids that to be ready for school each day means to have all that they need close by and ready to go. Each morning we stack their books and materials for the day on their desks. I want them to sharpen their pencils before we begin school, not in the middle of their first subject. I have noticed that when they start the day unprepared, they are more easily distracted and less productive. Being ready to begin working after our morning prayers helps our kids to be focused on school, rather than beginning their day scattered and unfocused. 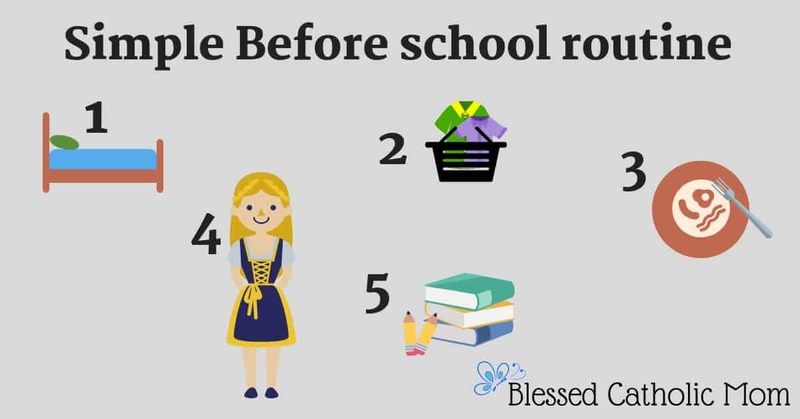 A simple before school routine is helpful to get the day started on the right foot. Making our beds, starting a load of laundry, having a good breakfast, cleaning up after breakfast, getting dressed, and having school supplies ready all add up to make to a good start for our day. Over the years I have come to realize that I’d much rather have a good start to our day than try all morning to recover from a bad start. What before school routine will help you and your kids get your day off to a great start?